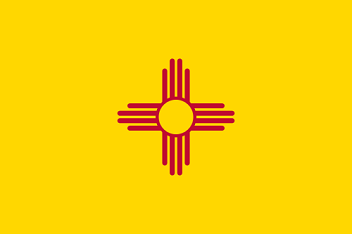 The bright golden yellow State Flag of New Mexico depicts the red symbol of the Zia sun symbol. The New Mexico flag serves as a symbol of honor, heritage and regional pride and is displayed at state buildings. The New Mexico State Flag is also flown on national and state holidays and on any other days proclaimed by the governor. There is a strict Order of Precedence for flags. State Flags are displayed in order as they entered the Union. 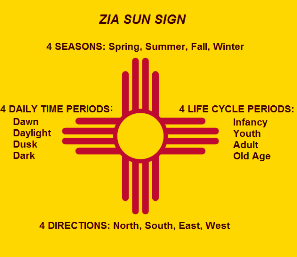 The New Mexico Flag is dominated by the highly symbolic image of the Zia Sun Symbol. The indigenous tribe of Zia Indians of New Mexico, descendents of the Pueblo tribe, regard the Sun as a sacred symbol. Four is a sacred number to the Zia people that represents the Circle of Life, the number 4 can be found repeated on the Zia Sun Symbol. The sun is represented by the central circle and has groups of 4 rays pointing in four directions. The picture of the Zia Sun Symbol illustrates the sacred meanings of the symbol. The four seasons of the year (spring, summer, fall and winter, the four stages of the human life cycle (childhood, youth, adult and old age), the four points of the compass (north, south, east, and west) and the four time periods of each day (morning, noon, evening and night). The Zia Sun symbol also represents the four sacred obligations that each person must develop (a clear mind, a strong body, a pure spirit, and a devotion to the welfare of others). Car Flags are often displayed to represent of an individual's allegiance to their state. New Mexico State car flags are used by their owners as mobile emblems of their home. Car flags are usually made from strong materials and are attached to a car via a pole and clip window attachment. What is the design of the New Mexico state flag? The design is a red sun symbol of the Zia on a field of yellow. What does the Zia Sun Symbol mean? What is the significance of the colors on the New Mexico State Flag? The distinctive red and yellow colors to honor Queen Isabella I of Castile (1451-1504) and her husband King Ferdinand II of Aragon. These two famous Spanish rulers funded conquistadors to expand their empire in the New World during the 1500's that were initiated by the voyages of exploration by Christopher Columbus. Who designed the New Mexico State Flag? What is the history of the New Mexico State Flag? 1920: The New Mexico Society of the Daughters of the American Revolution sponsored a competition to create a new design for a state flag. Dr. Harry Mera, an archeologist and doctor from Santa Fe, won the contest with an interpretation of a Zia sun symbol discovered on a 19th century water jar found at the Zia Pueblo. What is the Pledge of Allegiance and Salute? The salute should be made by standing at attention facing the flag with the right hand over the heart. The New Mexico flag is kept and used as required by the code specified in the constitution of the state. Official State Nickname "Land of Enchantment"